The declaration of war in 1914 was met with excitement as young men, fearful the ‘great adventure’ would be over before they could take part, rushed to enlist. Whether through displays of patriotism, fundraising, or sacrifices in their daily lives, everyone was called upon to show their support for the war. 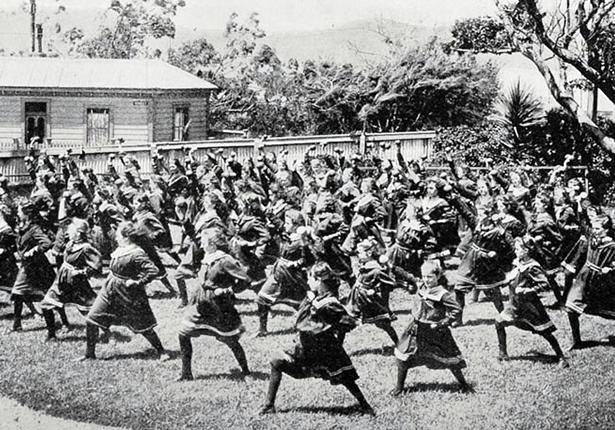 Schools and children were quickly called into action. Children raised funds for the war effort, knitted socks and scarves and wrote letters to the ‘boys’ at the front. In the years leading up to the First World War, the education system had helped prepare children for what would be expected of them. At school they learned not only to read, write, and do their sums, but also received instruction in moral virtues and imperialistic ideals. Developing fit and healthy citizens was also seen as important to the strength of the country and the Empire. Physical education and training in schools reflected the commonly held belief that a healthy body ensured a healthy mind. In the school cadets boys were taught to march, shoot straight and follow orders. Compulsory military training prepared a body of young men ready and willing to fight for ‘King, Country, and Empire’ in 1914. We have 25 biographies, 40 articles, related to Schools and the First World War.